TEXTE AUF SEINEN ANRUFBEANTWORTER - jamesgarners Jimdo-Page! "Hier Jim Rockford, bitte Ihren Namen, ihre Nummer und ihre Nachricht - ich rufe zurück"
Mit diesen Spruch hat Jim Rockford seinen Anrufbeantworter bestückt und in jeder Folge ruft jemand mit einer meist lustigen und / oder ironischen Anfrage oder Mitteilung an, was immer schon für den ersten Schmuzler oder Lacher der Episode beginnt. Wenn Ihr nach unten scrollt, habe ich alles auch in deutsch übersetzt. Es handelt sich nicht um die synchrongetreuen Texte, ich habe lediglich die hier vorliegenden englischen Texte übersetzt, weswegen einiges anders klingt, als man es kennt. 001 1974-03-27 "The Rockford Files" - 90 minute pilot (Later re-edited for syndication into two one hour episodes, entitled "Backlash of the Hunter" (Parts 1 & 2).) "Billings. LAPD. You know Thursday is Chapman's 20th year, and we're giving a little surprise party at the Captain's. I think you should come. By the way, we need five bucks for the present." (This message also appears in an episode in Season 6. Since the character of Lt. Chapman didn't appear until Season 3, it is likely that the message was original to the Season 6 episode and added on later to the syndicated version of the pilot). 101 1974-09-13 “The Kirkoff Case” "It's Norma at the market. It bounced. You want me to tear it up, send it back, or put it with the others?" 102 1974-09-20 “The Dark and Bloody Ground” "Hey Jim, this is Louie down at the fish market. You going to pick up these halibut or what?" 103 1974-09-27 “The Countess” "Hey Rockford, very funny. I ain't laughing. You're gonna get yours." 104 1974-10-04 “Exit Prentiss Carr” "It's Maury. Got a call from Davis at the IRS. You were right. They bounced your return. Call me." 105 1974-10-11 “Tall Woman in Red Wagon” "It's Laurie at the trailer park. A space opened up. Do you want me to save it or are the cops going to let you stay where you are?" 106 1974-10-18 “This Case is Closed” "Really want Simbu in the seventh? C'mon, that nag couldn't go a mile in the back of a pickup truck. Call me." 107 1974-10-25 “The Big Ripoff” "It's Aundra. Remember last summer at Pat's? I've got a twelve hour layover before I go to Chicago. How about it?" 108 1974-11-01 “Find Me If You Can” "This is the blood bank. If you don't have malaria, hepatitis, or TB, we'd like to have a pint of your blood." 109 1974-11-08 “In Pursuit of Carol Thorne” "This is the message phone company. I see you're using our unit, now how about paying for it?" 110 1974-11-15 “The Dexter Crisis” "I staked out that guy only it didn't work out like you said. Please call me. Room 234. County Hospital." 111 1974-12-06 “Caledonia -- It’s Worth a Fortune!” "It's John Jones. What did you do to the hand, son? Three fractured knuckles! You hit somebody?" 112 1974-12-20 “Profit and Loss, Part 1: Profit” "Hey Jimmy, this here's Tida Skaret. Remember me? From the Army. I'm stuck here in town. How about I come over and bunk with you, buddy?" 113 1974-12-27 “Profit and Loss, Part 2: Loss” "This is Mrs. Moseley at the library. We billed you for your overdue book Karate Made Easy. We abuse our library, we don't get our card renewed." 114 1975-01-03 “Aura Lee, Farewell” "Mr. Rockford? You don't know me, but I'd like to hire you. Could you call me at...my name is, uh, never mind. Forget it." 115 1975-01-10 “Sleight of Hand” "Rockford, this is Mr. Dow. If you think I'm going to pay to have your car repainted, you're nuts. You can take your expense bill and stuff it." 116 1975-01-17 “Counter Gambit” "Jim, it's Jack. I'm at the airport. I'm going to Tokyo and I want to pay you the $500 I owe you. Catch you next year when I get back." 117 1975-01-31 “Claire” "Mr. Rockford? This is the Thomas Crown School of Dance and Contemporary Etiquette. We aren't going to call again. Now, you want these free lessons, or what?" 118 1975-02-07 “Say Goodbye to Jennifer” "This is Mrs. Lindis. Three time this month I came to clean and it always look like people been fighting in there. Furniture broke, things tipped over. I'm sorry, but I quit." 119 1975-02-14 “Charlie Harris at Large” "Hey, Jim, it's me. Susan Ellis from the laundromat. You said you were going to call and it's been two weeks. What's wrong, you lose my number?" 120 1975-02-21 “The Four Pound Brick” "This is Shirley at the bank. The answers are: no, no, and yes. No, we won't loan you money. No, we won't accept any co-signers; and yes, your account's overdrawn. I get off at 4:30." 121 1975-02-28 “Just by Accident” "This is Thelma Sue Bigsley. It's about the research I called you about, family tree. Did you talk to your daddy? We may be kin." 122 1975-03-07 “Roundabout” "This is Marilyn Reed, I want to talk to you...is this a machine? I don't talk to machines." 201 1975-09-12 “The Aaron Ironwood School of Success” "Hi, Jim. We couldn't reach you, so we went ahead with the job and I know you're really going to dig it. But if you don't I suppose we can always tear it out." 202 1975-09-19 “The Farnsworth Strategm” "Rockford, this is Tony. Now, your car's ready. Couldn't reach you, so I went ahead and put in the new pistons. The tab's $527.54. And this time we're talking cash." 203 1975-09-26 “Gearjammers” — Part 1 "Okay, pal, it's Harry. I just checked my car. You kept the battery charged all right, you also put 3500 miles on it." 204 1975-10-03 “Gearjammers” — Part 2 "Jimmy, it's Angel. Don't pay no attention to my other message. You're out of it. You're clean, no trouble at all. Just ignore the first message." 205 1975-10-10 “The Deep Blue Sleep” "Hi, Jim. Thanks for the dinner invitation. I'd love to, but does it have to be the taco stand?" 206 1975-10-17 “The Great Blue Lake Land and Development Company” "Hello-Jim-Rockford's-machine. This-is-Larry-Doheny's-machine. Will-you-please-have-your-master-call-my-master-at-his-convenience? Thank-you. Thank-you. Thank-you." 207 1975-10-31 “The Real Easy Red Dog” "Jim? It's Shirley at the cleaners. You know that brown jacket, the one that I said looked so great on you? Your favorite. We lost it." 208 1975-11-07 “Resurrection in Black and White” "Hiya, Jimmy, it's cousin Lou. Going to be in town a coupla days. Know you won't mind putting us up. It's just me and Aunt Sissy and B.J. and the kids and little Freddie." 209 1975-11-14 “Chicken Little is a Little Chicken” "Jim, it's Beth. You have the vet's number, the flea collar and extra litter. One thing I forgot, keep him away from the other cats. He's not very discriminating." 210 1975-11-21 “2 Into 5.56 Won’t Go” "Jim, it's Maria over at the laundromat. There's a yellow dress in with your things. Is that a mistake, or special handling, or what?" 211 1975-11-28 “Pastoria Prime Pick” "Hey, Jimbo, Dennis. Really appreciate the help on the income tax. Wanna help on the audit now?" 212 1975-12-05 “The Reincarnation of Angie” "Hi, Jim, it's Jamie at the police impound. They picked up your car again. Lately, they've been driving it more than you have." 213 1975-12-19 “The Girl in the Bay City Boy’s Club” "Hi, sonny, it's Rocky. I got the bill and I've been trying to figure out what everybody owes on L.J. 's birthday party. Tell me, did you have the Pink Lady?" 214 1976-01-09 “The Hammer of C Block” "It's Jack. The check is in the mail. Sorry it's two years late. Sorry I misfigured my checking account and I'm overdrawn. Sorry I stopped payment on it. So, when it comes, tear it up. Sorry." 216 1976-01-23 “A Portrait of Elizabeth” "Jim, it's Harry. We've been waitin' on you for two hours at the Forbes'. Where's the forks? Lasagna ain't no finger food." 217 1976-01-30 “Joey Blue Eyes” "Sorry, Jim, this is for Rocky. Hey, Rock...Stan. Top that redhead and her sister. 10:30, Stacy's Grill. **chuckle**"
218 1976-02-06 “In Hazard” "Mr. Rockford, Miss Miller of the Bartlett Book Club. Great Detectives of America is not in stock, so we sent you Cooking Made Easy. Hope you enjoy it." 219 1976-02-13 “The Italian Bird Fiasco” "Jim? Sally. Hey, I just found you were an Aries. Listen, if you have Virgo rising, give me a call." 220 1976-02-20 “Where’s Houston?” "Jim? Nadine Arcala at the Zodiac Restaurant. You don't pay that dinner tab, we're gonna repo your birthday." 221 1976-03-12 “Foul on the First Play” "Jim, it's Eddie. You were right about Sweet Talk in the seventh. He breezed in, paid $72.50. But I didn't get your bet down." 222 1976-03-19 “A Bad Deal in the Valley” "Uncle Jim? It's Ralph. I got your letter, but I moved out here anyway. I really want those detective lessons." 301 1976-09-24 “The Fourth Man” "Hi, just want to put your mind at rest. Found your address book in the theater last week. By the way, Carol's okay, but Linda..."
302 1976-10-01 “The Oracle Wore a Cashmere Suit” "Teddy's Tree House. You've won free landscaping services for one full year. We'll mow your lawn, top your tree, mulch, seed, fertilize, and feed. Isn't that wonderful?" 303 1976-10-08 “The Family Hour” "Hey, Jim, it's Frank. Me and Ellie's down here for our convention. Can't wait to see you. Should be over at your place about 1 AM. Banzai, buddy. 304 1976-10-15 “Feeding Frenzy” "Hi, this is the Happy Pet Clinic. Your father gave us this number when he left town. The calico stray had six kittens. Please come get them. Today!" 305 1976-11-05 “Drought at Indianhead River” "Jim, thanks for taking little Billy fishing, he had a great time. Turns out he really wasn't seasick. Um, have you ever had chicken pox?" 306 1976-11-12 “Coulter City Wildcat” "It's Shirley at the Plant and Pot. There's just no easy way to tell you this, Jim. We did everything we could. Your fern died." 307 1976-11-19 “So Help Me God” "Dr. Souter's office. This is the third time you've cancelled. Now, you have to have that root canal. A sore foot has nothing to do with your mouth." 308 1976-11-26 “Rattlers’ Class of ‘63” "Gene's 24 Hour Emergency Plumbing. Your water heater's blown? We'll have somebody out there Tuesday. Thursday at the latest." 309 1976-12-10 “Return to the Thirty-Eighth Parallel” "Tompkins at Guaranteed Insurance. About your burglary claim. Major loss all right. Funny you remembered to file, but you didn't remember to pay your premium." 310 1976-12-17 “Piece Work” "This is Dr. Souter's office again, regarding that root canal. The doctor is in his office...waiting. He's beginning to dislike you." 311 1976-12-24 “The Trouble With Warren "Jimmy, it's Phil in Puerto Rico. This is real important. Talked to Mr. [line noise], he'll pay $20,000. Call him at [line noise]." 312 1977-01-07 “There’s One in Every Port” "Bummer! I call up with some good vibes and some positive energies and I talk to a robot? Forget you, man!" 313 1977-01-14 “Sticks and Stones May Break Your Bones, But Waterbury Will Bury You” "This is the Department of the Army. Our records show that you are the "Rockford, James" who failed to turn in his service automatic in May 1953. Contact us at once." 314 1977-01-21 “The Trees, the Bees and T.T. Flowers” — Part 1 "Jimmy, old buddy, buddy. It's Angel! You know they allow you one phone call? Well, this is it." 315 1977-01-28 “The Trees, the Bees and T.T. Flowers” — Part 2 "Hello? Hello? Hello? Hello?" 316 1977-02-11 “The Becker Connection” "Hi, um, I'm confused. Is this Dial-A-Prayer? Well, should I call back when the reverend's in the office, or what?" 317 1977-02-18 “Just Another Polish Wedding” "George Devon, Malibu Space Watch. Had three sightings last week. You see anything unusual? Television reception interrupted? Call 555-1313." 318 1977-02-25 “New Life, Old Dragons” "It's Pete. Hope you enjoyed using the cabin last week. Only next time leave the trout in the refrigerator, huh? Not in the cupboard." 319 1977-03-11 “To Protect and Serve” — Part 1 "This is Dusty, your father's friend. So you helped me move, that's it? See if maybe I don't like the new place? See if maybe there's some painting to be done?" 320 1977-03-18 “To Protect and Serve” — Part 2 "This is incredible. Do you know last night I had one of my dreams? I dreamed that if I called you, you wouldn't be home. And you're not." 321 1977-03-25 “Crack Back” "This is Doctor Souter. My nurse tells me you've blown four root canal appointments. Well, you're finished in this office." 322 1977-04-01 “Dirty Money, Black Light” "This is Toby. I forgot what I was calling for. Your recording is so boring. Spike it with some humor, some personality. Something." 401 1977-09-16 “Beamer’s Last Case” [loud traffic noise in background] "Jimmy, this is Angel. I've got this new pad, right over by the Hollywood Freeway, and some friends are coming. Borrow your record player?" 402 1977-09-23 “Trouble in Chapter 17” [Noises from large dog in background] "Jim, this is Donna. Boy, we've been swamped today. No, sit. We should be closing in about...sit. I'll meet you at...oh, get down." 403 1977-09-30 “The Battle of Canoga Park” "It's Betty from up the street. I'm phoning all the neighbors because Spotty is loose. If you see him, call me. Oh, don't wear musk cologne. Leopards have a thing about that." 404 1977-10-14 “Second Chance” "This is Globe Publications. Our records show you did not return your free volume of the Encyclopedia of Weather. So we'll be sending you the remaining twenty-nine volumes. You'll be billed accordingly." 405 1977-10-21 “The Dog and Pony Show” "Jimmy, Lou. You owe me five bucks. Matarozo's average in the '68 Series was .310 not .315. Oh...and...uh...Fran and I are getting divorced." 406 1977-11-04 “Requiem for a Funny Box” "Mr. Rockford, Sue Ellen. Our class is having that crazy scavenger hunt I told you about. If you're wondering what happened to your trailer door, it's going to win me first prize." 407 1977-11-11 “Quickie Nirvana” "Hey, I saw your ad in the classified. Three African goats for sale. I keep calling and all I get is a machine. Is this a typo in the paper, or what?" 408 1977-11-18 “Irving the Explainer” "Hey, am I too late for those African goats? Haven't got the whole three hundred cash, but, like I've go a whole lot of homemade cheese. Maybe we should work something out." 409 1977-11-25 “The Mayor's Committee from Deer Lick Falls” "So you put your machine on at night, huh? Just because I call you at 3 A.M.? You know how bad my insomnia is. Thanks a lot Jim." 410 1977-12-02 “Hotel of Fear” "Jim? This is Manny down at Ralph's Bar. Some guy named Angel Martin just ran up a fifty buck bar tab. Now he wants to charge it to you. You gonna pay it?" 411 1977-12-09 “Forced Retirement” *Beep* "Hi, there. If you are interested in selling a product by a computerized telephone sales *beep* stay on the line and one of our representatives will speak with you." 412 1977-12-16 “The Queen of Peru” "Jim, it's Grace, at the bank. I checked your Christmas Club account. You don't have $500. You have $50. Sorry, computer foul up." 413 1977-12-23 “The Deadly Maze” "Hey, Jimmy, I tried to catch you before you left. Hey buddy, I was wrong. The rally in Mexico, it was yesterday." 414 1978-01-06 “The Attractive Nuisance” "Jimmy Scott? This is Aunt Bea from Tulsa. Cousin Randy just graduated from high school and wants to be a producer. Now you live out in Hollywood, you just do something." 415 1978-01-13 “The Gang at Don’s Drive-In” "Jim, I have finally finished twelve long years of psychotherapy and I'm now able to tell you just what I think of you. Would you please call me?" 416 1978-01-20 “The Paper Palace” "This is Mrs. Owens with the Association For A Better Malibu. Thanks for your contributions. We've made real strides, but it would help dear, if you could move your trailer." 417 1978-01-27 “Dwarf in a Helium Hat” "Here's the tally, Jimbo. You had Atlanta at even money, tough break. And you got bombed in the Duke-Wake Forest fiasco, and you split the Cornell at Hollypark. So you're in the book for $4.50. Anytime before Friday, huh, buddy?" 418 1978-02-03 “South by Southwest” "Bill Skelly with ICO. I'd like to interest you in some new private detection, including the 44OA Telephonic Bug. We'll demonstrate it in a friend's home for one full week, at no charge. 419 1978-02-10 “The Competitive Edge” "Okay, Jimbo, Dennis. I know you're in there. And I know you know it's ticket season again. Policeman's Ball and all that. So come to the door when I knock this time. I know you're in there." 420 1978-02-17 “The Prisoner of Rosemont Hall” "That number four you just picked up from Angelo's Pizza? Some scouring powder fell in there. Don't eat it. Hey, I hope you try your phone machine before dinner." 421-1 1978-02-24 “The House on Willis Avenue” — two-hour episode Re-edited for syndication into two one-hour episodes. "Good morning, this is the telephone company. Due to repairs we're giving you advance notice that your service will be cut off indefinitely at 10 o'clock. That's two minutes from now." 421-2 1978-02-24 “The House on Willis Avenue Part II" — two-hour episode Re-edited for syndication into two one-hour episodes. "Sonny, this is Dad. Never mind giving that talk on your occupation to the Grey Power Club. Hap Dudley's son is a doctor and everybody'd sorta...well, rather hear from him, but thanks." 501 1978-09-22 “Heartaches of a Fool” "Say, I'm the one who hit your car at Fork City, I've got no insurance, I'm broke. But, I really wanted you to know how sorry I am. If it makes you feel any better I hurt my arm." 502 1978-09-29 “Rosendahl and Gilda Stern are Dead” "Hello? Are you the guy who lost a wallet in the Park Theater? Well, I'm kinda like into leather. So, I'll be returning the money, but I'm going to keep the wallet." 503 1978-10-06 “The Jersey Bounce” "Jimmy, Angel. Here's a tip, but his handwriting's bad. Third Son in the fifth race at Bel Meadows. Wait a minute, could be Fifth Son in the third. Wait, this might be next week's race." 504 1978-10-20 “White on White and Nearly Perfect” "Pacific view lots. Perpetual care by people who care. At an unbelievably low price. Call Montief and Snell, the full service mortuary. We won't rest easy, until you rest easy." 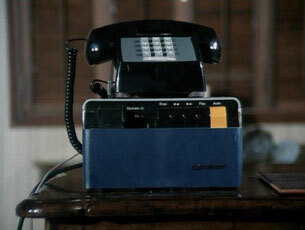 505 1978-10-27 “Kill the Messenger” "Jim, Chet, returning your call. Sorry I missed you, but I appreciate you calling back. And if you call again and I'm not in, just leave your message and I'll get back to you." 506 1978-11-03 “The Empty Frame” "Jim, directions to the party. Left on Sagis, you'll see a rock. Left, left again, right, another left, there's kind of a hill--keep going you'll probably see a bunch of cars." 507 1978-11-10 “A Three-Day Affair with a Thirty-Day Escrow” "Rockford? Alice, Phil's Plumbing. We're still jammed up on a job, so we won't be able to make your place. Use the bathroom at the restaurant one more night." 508 1978-11-17 “A Good Clean Bust with Sequel Rights” "Jim, I have to thank you for talking over my problems with me last Tuesday night. I love you for it, but can you have lunch tomorrow to talk about the divorce? I'm real bummed out." 509-1 1978-11-24 “Black Mirror” — two-hour episode. Re-edited for syndication into two one-hour episodes. "Jim, I leave London four o'clock, arrive L.A. nine. I guess that's London time. Yeah, four to nine is five, minus twelve flying... no, plus twelve. Ah, but then there's a time change." 509-2 1978-11-24 “Black Mirror” — two-hour episode. Re-edited for syndication into two one-hour episodes. "Rockford, Jake at the Sand Pebble. Sorry old buddy, but there have been gunshots around your place once too often. The neighborhood association wants to have a talk with you." 510 1978-12-01 “A Fast Count” "Jim, you give Peg the two hundred for the painting. She owes me seventy and I owe you forty-six for the Christmas trees. Harry's still out sixty for the dinner, but at least it'll void that check." 511 1978-12-08 “Local Man Eaten by Newspaper” "Sonny, this message ain't for you, it's for me. I just want to pick up the ladder at the Paint Mart." 512 1979-01-05 “With the French Heel Back, Can the Nehru Jacket Be Far Behind?” "Jim, Coop. I'm at the address you wrote down for the poker game tonight. This is a gas station, it's closed, there's no one around and my car is stalled. Now, you got to call me at 4-6-6-3-*click*." 513 1979-01-12 “The Battle-Ax and the Exploding Cigar” "Miss Hollroy, City Federal. Your lost check still hasn't arrived. It's impossible for us to lose checks, so unless we received full payment by noon today we'll foreclose." 514 1979-01-19 “Guilt” "Jimmy, Angel. Listen, Eddie Talliferro just gave me a hot tip on a class filly in the eighth at Holly Park. Only trouble is I need twenty." 515 1979-01-26 “The Deuce” "Mr. Rockford, Arthur's Hi-Fi. Your stereo is ready, but since your warranty expired in the two months it was in our shop, you'll have to pay the $60 on the repair." 516 1979-02-10 “The Man Who Saw the Alligators” — 90-minute episode — Re-edited for syndication into a single one-hour episode, removing some scenes and footage. "Mr. Rockford, you know what if you are attacked and killed? Ask for Albert Kimcee at grand opening of Happy Dawn School of Secret Arts. Win free lesson." 517 1979-02-17 “The Return of the Black Shadow” "Jim, this is Florence Boyle, you worked for my husband last month in Glendale. You were so helpful then, and, well I have a problem of my own I'd like to discuss. Confidentially, of course." 518 1979-02-24 “A Material Difference” "Jim, Joel Myers at Crowell, Finch, and Merriwether. We're going to court tomorrow with that Penrose fraud case, but steno misplaced your 200 page deposition. Could you come down tonight and give it again? 519-1 1979-03-03 “Never Send a Boy King to Do a Man’s Job” — two-hour episode. Re-edited for syndication into two one-hour episodes. "Mr. Rockford, Miss Collins from the Bureau of Licenses. We got your renewal before the extended deadline, but not your check. I'm sorry, but at midnight you're no longer licensed as an investigator." 519-2 1979-03-03 “Never Send a Boy King to Do a Man’s Job” — two-hour episode. Re-edited for syndication into two one-hour episodes. "Jim, Denny from Denny's Pest Blasters. Got a great deal for ya. We'll rub out your rodents at a tremendously low cost. So call us, we're in the Yellow Pages and we mean business." 520 1979-04-13 “A Different Drummer” "Jim, this is Andrea at Todd's Food Mart. Listen, there's a guy down here by the name of Angel Martin who's charged $110 worth of groceries to your account. Is that okay with you?" 601 1979-09-28 “Paradise Cove” "Jim, this is Cal of the Leave The Whales Alone Club, Our protest cruise leaves from the pier Saturday at 3 AM. The whales need you, Jim." 602-1 1979-10-05 “Lions, Tigers, Monkeys and Dogs” — Part 1 "This is Betty Frinell. I don't know who to call, but I can't reach my Food-Aholics partner. I'm at Vito's on my second pizza with sausage and mushroom. Jim, come and get me." 602-2 1979-10-12 “Lions, Tigers, Monkeys and Dogs” — Part 2 "Jim, this is Janelle. I'm flying tonight so I can't make our date. But I've got to find a safe place for Daffy. He loves you, Jim. It's only two days and you'll see, Great Danes are no problem." 603 1979-10-19 “Only Rock ’n’ Roll Will Never Die” — Part 1 (sung) "We're down at Hennesey's Bar, Jim, having a drink or two. You better get down here quick, Jim, or we'll probably take your stool!" 604 1979-10-26 “Only Rock ’n’ Roll Will Never Die” — Part 2 "Jimmy, this is Dora. I'm gonna move in with the kids, but I'll sure miss you, dear. Thank you for taking out the garbage every week. I'll send you a card for your birthday." 605 1979-11-09 “Love is the Word” "This is Maria at Liberty Bail Bonds. Your client Todd Lehman skipped and his bail is forfeit. That's the pink slip on your '79 Firebird, I believe. Sorry, Jim, bring it on over." 606 1979-11-16 “Nice Guys Finish Dead” "Jim, Dwight. I put a new outlet in the kitchen. I lay in the cable and the box. Then I pull the breaker just like you said. And both of my tv sets start burning. What should I do now? 608 1979-11-30 “The No-Fault Affair” "Oh, I thought this was Dial-A-Joke. I'm going to a party and I need some icebreakers. But, uh, I guess that's...that." 609 1979-12-07 “The Big Cheese” "This is The Baron. Angel Martin tells me you buy information. Okay, meet me at 1 A.M. behind the bus depot, bring $500, and come alone. I'm serious." 610 1979-12-14 “Just A Coupla Guys” "Mr. Rockford, this is Betty-Jo Withers. I got four shirts of yours from the Bo Peep Cleaners by mistake. I don't know why they gave me men's shirts, but they're going back." 611 1980-01-10 “Deadlock In Parma” "Because where you live says so much about you, your home has been selected by Royal Imperial Roofing and Siding as our neighborhood showcase. A bonded representative will call on you." 005 1996-02-25 The Rockford Files: Friends and Foul Play — a.k.a. Fieldtrip to a Funeral Not listed. 006 1996-09-18 The Rockford Files: Punishment and Crime — a.k.a. Night Fishing Not listed. Robertson, Ed. (2005). Thirty Years of "The Rockford Files": An Inside Look at America's Greatest Detective Series. Lincol, NE: ASJA Press. 497 pages. (Lists all of the answering machine gags). "Billings vom L.A. P.D. Du weißt, Donnerstag ist Chapmans 20. Jahrestag, und wir geben eine kleine Überraschungparty des Captains. Ich denke, du solltest kommen. Übrigens, die fünf Dollar müssen wir schon vor der Party bekommen. (Diese Meldung erscheint auch in einer Episode in Staffel 6. Da der Charakter Lt Chapman erst Staffel 3 erscheint, ist es wahrscheinlich, dass die Nachricht ursprünglich auf die Staffel 6 Episode war und fügte hinzu, auf später zu den syndizierten Version des Pilot). "Hier istNorma auf dem Supermarkt. Ihr Scheck ist geplatzt. Soll ich ihn zerreißen, oder soll ihn ihn zu den anderen legen?" Folge 2: "Suche nach dem Namenlosen"
"Hey Jim, hier ist Louie aus dem Fischmarkt. Holen Sie endlich diesen Heilbutt mal ab oder was? Der stinkt schon!" Folge 3: "Wer erschoss Carl?" "HeyRockford, sehr lustig. Mir ist nicht zum Lachen zumute. Du wirst kommen, ist das klar?." Folge 4: "Ausfahrt Bay City"
"Hier istMaury. Bekam einen Anruf von Davis an der IRS. Du hattest recht. Sie hüpften bei Ihrer Rückkehr. Rufen Sie mich an." Folge 5: "Eine Tote auf Reisen"
"Hier istLaurie vom Trailer-Park. Ein neuer Platz ist frei geworden. Willst du den haben oder soll ich der Polizei sagen, daß du bleibst wo du bist?" Folge 6 & 7: "Wer ist Mark Chalmers? - Teil 1 & 2"
"Wirklich? Sie wollen Simbu in der siebten wetten? C'mon, der Gaul könnte noch nichtmal gegen einen alten Pick up gewinnen, wenn der im Rückwärtsgang fährt.. Rufen Sie mich an." "Hier istAundra. Erinnerstr Du dich? Letzten Sommer bei den Pats? Ich habe eine 12 Stunden Zwischenstopp, bevor ich nach Chicago zu gehen. Wie wäre es?" Folge 9: "Der ehrenwerte Mr. Correll"
"Hier ist dieBlutbank. Wenn Sie an Malaria, Hepatitis oder Tuberkulose sterben wollen, möchten wir einen halben Liter Blut haben." Folge 10: "Freund oder Feind"
"Das ist eine Nachricht von ihrer Telefongesellschaft. Ich sehe, Sie sind mit unserer Dienste zufrieden. nun, wie wärs, wenn Sie endlich auchmal dafür zu bezahlen?" "Ichhabs so gemacht, wie Du mir gesagt hast. Hat nur nicht geklappt, wie du gesagt hast. Bitte rufe mich an. Zimmer 234. County Krankenhaus." Folge 12: "Schatzsuche mit Hindernissen"
"Hier istJohn Jones. Was haben Sie mit ihren Händen zu tun, mein Sohn? Drei gebrochene Knöchel! Trifft Du jemanden?" Folge 13: "Der große Aktienschwindel - Teil 1"
"HeyJimmy, hier ist Tida Skaret. Erinnere Du dich an mich? Von der Armee. Ich hänge hier in der Stadt fest. Wie wäre es, wenn ich über rüberkomme und wir Etagenbetten mit dir spiele, mein Freund?" Folge 14: "Der große Aktienschwindel - Teil 2"
Hier istMrs. Moseley von der Bibliothek. Wir berechnen Ihnen für Ihre überfällige Gebühr zum Buch „Karate machen leicht gemacht“. Sie missbrauchen unsere Bücher nicht nochmal, sonst bekommen Sie nicht unsere Karte erneuert." Folge 15: "Der Unfall des Senators"
"Mr.Rockford? Sie kennen mich nicht, aber ich möchte Sie anheuern. Könnten Sie mich anrufen unter ... mein Name ist, äh, vergessen Sie…es ist nichts. " "Rockford, hier ist Mr. Dow. Wenn Du denkst, ich werde bezahlen, um dein Auto umzulackieren denke ich, das du verrückt bist. Du kannst Deine Kosten Rechnung nehmen und sie dir sonsthinstopfen. Folge 17 "Ein Auftrag aus dem Knast"
"Jim, hier ist Jack. Ich bin am Flughafen. Ich will nach Tokio fliegen und ich möchte Sie bezahlen. Ich verdanke Ihnen $ 500 . Die bekommen Sie nächsten Jahr, wenn ich zurückkomme." Folge 18 "Liebe, Drogen, Tod"
"Mr. Rockford? Hier ist die Thomas Crown School of Dance and Contemporary Etiquette. Wirwerden nicht wieder anrufen. Jetzt wollen Sie schon kostenlosen Unterricht, oder was?" Folge 19 "Rätsel um Jennifer"
"Hier ist Mrs. Lindis. Drei Mal in diesem Monat kam ich zu Ihnen zum Reinigen und ich habe immer wieder Menschen bei Ihnen dort kämpfen sehen. Möbel kaputt, Dinge umgekippt. Es tut mir leid, aber ich werde bei Ihnen aufhören." Folge 20 "Die Lady am Strand"
"Hey, Jim, ich bins . Susan Ellis aus dem Waschsalon. Sie sagten, Sie würden anrufen und es ist schon zwei Wochen her. Was ist los mit Ihnen, haben Sie meine Nummer verloren? Folge 21: "Die Polizei, dein Freund und Feind"
"Hier ist Shirley von der Bank Die Antworten sind: nein, nein und ja, nein, wir werden nicht Geld an Ihnen leihen, Nein, wir akzeptieren keine Mitunterzeichner, und ja, Ihr Konto ist überzogen ich.... off um 16:30. " Folge 22: "Tod durch Unfall"
"Hier ist Marilyn Reed, ich will mit dir reden ... ist das etwa eine Maschine? Ich glaube es ja nicht…Ich spreche nicht mit Maschinen!" Ab Staffel 2 setze ich ein, sobald isie fertig übersetzt habe!